Nia Ruth is a senior Creative Writer at Cooperative Arts and Humanities High School. Ruth is 17 and intends on going into dentistry after high school. Ruth first gained an interest in fashion when she was fourteen. When asked what fashion meant to her she responded, “I like fashion; I find it cool that clothes can express who you are, it’s a way for me to express myself and look nice.” Ruth expresses herself with a “uniquely vintage” sense of style, “with a mix of trends.” She doesn’t limit herself to specific brands or designers; instead she wears “a little bit of everything.” She tends to shop at stores like Urban Outfitters, H&M, Alloy and thrift stores or other shops that carry vintage apparel. Ruth really enjoys wearing red and blue because “those are two colors you can blend with anything.” She also adores cool shades of grey, proclaiming that “they were love at first sight.” Ruth is also fond of accessories because they liven up even the simplest of outfits. It doesn’t take much for her to decide when an outfit is complete--once she declares “Ooh, I like that” she is finished styling. When she’s not spending her money on clothes, she tends to buy food and she considers herself a combination of both a trendsetter and a trend follower. Some brands that Ruth dislikes are Aeropostale, Rocawear and Baby Phat. She also dislikes bellbottom jeans and the shoe brand Pastries; she considers them one of the worst style choices. In sum, Nia Ruth is a well-dressed senior at Co-op who you can catch roaming the halls, and you can learn a lot about style from looking at her. Yes! It's that time of year! Sayonara snow and blistery winds, and hello spring! With warm weather and sun-filled days quickly approaching, our thoughts are certainly turned to days at the pool, hot barbecues, and walks on the beach. As the seasons and our activities change, so do our wardrobes. If you are looking to shake things up in your closet this spring, you have picked a golden year to do so. Whether you prefer to use what you already own, purchase a few new pieces, or do a complete wardrobe makeover, I have the greatest advice for this season's new trends that are versatile enough to be wearable for anyone to look good and feel great! Spring and summer of 2013 are bringing an array of trends to store racks, and bold colors are the perfect way to showcase a distinctive fashion statement. If you’re looking to make the ultimate fashion statement, then it’s time to incorporate some color into your wardrobe! And not just any colors, but BOLD colors! Color can be an instant mood booster, and this season color is dominating the runways and store racks. Moreover, if you’re unsure as to how to pull off a bold color look, try mixing neon accessories or brightly colored tops with a neutral outfit to keep your look clean and streamlined. Sticking to one color can definitely be a nice look for anyone. However, adding a color accessory (scarf, jewelry, and/or sunglasses) can create a unique fashion statement. Lastly, fashion is a form of self expression. So be loose and creative with your wardrobe! Never be afraid to unfasten your style. Remember, being “fashionable” is to be confident and be you! Until next time, rock those bold COLORS! Over the weekend, the new Air Jordan V “Grape” was released. The sneakers are now available at many locations throughout the state and across the country. The sneakers retail at a hefty price tag of $160, and can be purchased at Jordan Brand retailers, including Jimmy’s. However, if you are willing to wait a few weeks they should gradually reduce in price. The sneakers feature a vibrant white, turquoise, purple and black colorway. What makes this release so special, however, are not the unique colors, but the fact that this is the first time Air Jordan V’s have been released in almost a decade (seven years). Also, this is only the second time the sneakers have been resurrected since their birth in 1990. The athletic shoes make for a perfect addition to anyone’s spring wardrobe due to their cool colors. Additionally, because of the wide array of colors the shoe is quite versatile. You’ll definitely get your money’s worth with these sneakers. The only downside would be the fact that the sneakers are made of soft leather, which make them prone to premature creases. Additionally, due to the primary color being white, the footwear is bound to get dirty rather swiftly. However, this can be remedied with nail polish remover, dish soap and water, so it won't be a major issue. The next pair of sneakers to be released by the brand are the Air Jordan V “Black Grape.” These sneakers will be available June 1, 2013 at the same retail locations that carried the Air Jordan V “Grape.” Be sure to check back towards the end of the month for an update and review of the upcoming footwear. As of late, it’s been a trend for celebrities to capitalize on their fame by creating their own fashion labels, brands, lines, and collections. However, not everyone possesses an eye for fashion, and being a pop star or award-winning actress doesn’t necessarily qualify you to be the next Donna Karan. In this article, celebrity fashion brands will be critiqued and reviewed. One celebrity to take a stab at the fashion industry is Chris Brown. In November of 2012, Brown released his own line in a joint venture with the popular street fashion label Pink Dolphin. Pink Dolphin and Brown collaborated to create a line called Black Pyramid. According to Brown, “We really haven’t mastered the art of making a pyramid ourselves, like the ancient ones, so it’s kinda like an unknown art. So I think my painting, my designs, whatever I do fashion wise is unknown to a lot of people.” The meaning behind the name of the line is certainly unique, however the line lacks the creativity expressed in its title. In fact, the names of the product translate quite literally in the clothes; one piece is simply a gray hoodie with illustrations of a pink dolphin and a black pyramid. Also, the line lacks diversity. Every article of clothing designed by Brown is just a variation of the dated graphic tee with an illustration featuring a pink dolphin and the company’s name. Additionally, the line is strictly streetwear--hoodies and t-shirts. Brown’s visual artistic talent and sense of style do shine through the collection, but the collection isn’t much different than any other streetwear brand. Both of the singer’s past objects of affection have also decided to venture into the fashion world. Karrueche Tran, Brown’s second love, was less successful than the first. Originally, her line was set to launch online back in January, but the day never seemed to arise. Judging from the prototypes showcased at a party, her designs featured hats, t-shirts, and hoodies void of color and plastered with the slogan “The Kill”. They lacked creativity, more so than Brown's. Last month, rapper Nicki Minaj also decided to take part in the fashion industry. On March 1, Minaj launched her lifestyle brand “The Nicki Minaj Collection” in West Hollywood. The collection was done in collaboration with Shopyourway.com and Kmart, the same superstore that sells toys, food, gardening supplies, technology etc. The line is perfect for those on a budget, but not for one pursuing high fashion. Fellow rapper Big Sean debuted his fashion line, Aura Gold, in a magazine spread for "Vibe" magazine. The clothing line is reminiscent of the 90’s and features heavy influence from hip hop culture and streetwear. The designs vary from vibrant hues of red-orange, and darker shades of navy and black. The piece that sticks out the most is a navy sweatshirt featuring a white illustration of a lion's face wearing a crown of thorns. The sweatshirt has leather sleeves and a cotton body. The spread provides only a preview of the Fall 2013 collection, but from what can be seen the line definitely has potential. Will Smith’s son, Jaden Smith, also delves into the fashion industry with his line MSFTS. His collection was featured on BET’s 2013 Rip The Runway. The event was held in New York and hosted by Kelly Rowland and Boris Kodjoe. The line wasn’t anything to boast about. The best articles of clothing produced by Jaden were his camouflage printed socks. But the primary pieces--the shirts, the hoodies, the face masks--all of them seemed uninspired. In sum, many celebrities have begun to take a dip in the fashion industry, but the most successful of the ones listed is definitely Big Sean. His designs had the most variability and individualism, as well as the widest range of color and versatility. Spring and summer 2013 are bringing an array of different trends to store racks, and stripes and ruffles are the perfect way to showcase a distinctive fashion statement. Stripes: they are straightforward, flattering, and timeless. As stated by Glamour magazine, "with denim, they're all-American; with navy, they're natural-chic; worn head to toe, they're plain cool." If you do not already have something striped in your closet, this is a safe trend to add to your list. And of course, vertical stripes are always slimming. Who doesn't want that? Another fantastic distinctive look can be had with ruffles. Ruffles are soft, frilly, and this season can be found from collars to sleeves to hemlines. They can easily be dressed up or down, worn to the office or a night on the town. If you are seeking a classic feminine and flirty look, ruffles may be the trend to work into your closet this season. Ms. Englart definitely learns from the best as she displays a complex fashion statement, only she could ROCK! Her bright yellow scarf shines on an olive green cashmere sweater. Her classic denim pencil skirt is worn fabulously over bright teal stockings which praise lovely Carmen wedges. 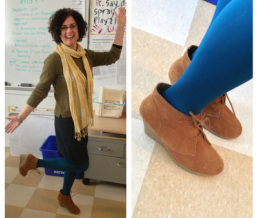 Way to Go Ms. Englart; a definite fashion trend approval! From floral fetishes to futurism, designers get creative with all the extras. 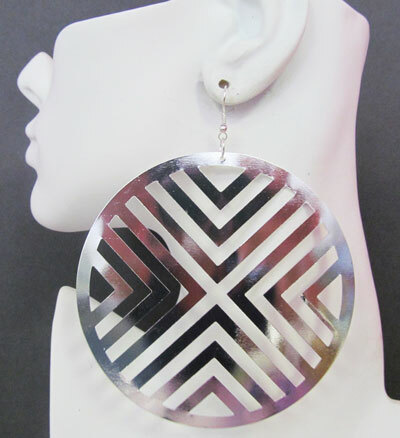 Earrings are a great accessory. For example, you can wear stud earrings with a nice ponytail, or even when you hair is down if you have a round face. 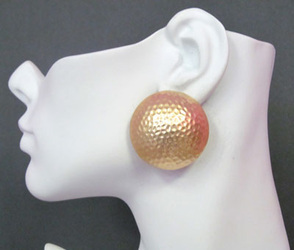 You can wear long earrings if you have a long, oval head and a long neck, with any hair style. Crochet earrings, Square earrings, Feather earrings, Silver Earrings, Round earrings, Thread earrings, Button earrings. There are so many more earrings, but if I kept the list going I’ll be writing for years. I love earrings; they make your outfit and they can make a bad hair day good. Did you ever wonder how you can make an outfit on a budget from your favorite stores? Here are some outfits that I personally picked out that you can buy for less and still look stylish. I stuck to a price of $30 - $50 making outfits from stores to make that perfect outfit. Everyone knows that acne is probably one of the worst things teenagers have to go through. So here are 10 helpful steps to make your life easier. 1. Wash your face TWICE a day! Once isn’t enough; you have to make sure you wash your face 2 times, preferably when you wake up and before you go to bed. In the process of washing your face, make sure you DON’T SCRUB! If you have dry skin, make sure to purchase a face wash that won’t strip your face of its natural oils. If you have oily skin, make sure to purchase a face wash that is Oil-Free. 2. Substitute your cans of soda, bars of chocolate and sugary energy drinks for bottles/glasses of water! It is recommended that you drink 8 glasses of water a day to keep your skin hydrated. 3. This may be gross, but you’re not supposed to pop your pimples. Though it is tempting, it can result in redness, and even scarring. 4. Girls, make sure to remove all of your makeup before bed. It is also recommended that you buy makeup that’s ‘noncomedogenic’ and or ‘nonacnegenic’. Stores also sell Oil-Free makeup. 5. Avoid touching your face. We touch a lot of unclean things throughout the day, and when you touch your face it can spread bacteria, leading to acne. 6. Keep your hair out of your face to prevent the oils from clogging your pores. 7. Eat healthy! A change in your diet can make your face and body look and feel healthier. 8. Witch hazel can be used as an astringent to cleanse your face after you’ve washed it. 9. When drying your face, gently pat with a soft towel until dry. Do not scrub and make sure that you do not allow and water to dry on its own. 10. If you have dry skin, you can apply moisturizer after you’ve washed and dried your face. Are you sick of just being a plain old nurse or teacher at your friend's costume party? Do you want to have the best October costume compared to your friends? If so, the answer is very simple. Read this article! Everyone wants to be a cop or a sweet little angel, so think outside the box! Two great ideas are the hot and fresh “Cat woman”, recently played by Anne Hathaway, or the “Fierce Five” gold medal gymnastics team! And yes, I know what you’re thinking! I am reading this article to become more fashionable, but I have no clue how to make either of these amazing costumes. Well, you’re just in time to find out how to make the hottest costumes of 2012. 1. Starting with a clean face, apply an equal amount of foundation all over your face. 2. Line both top and bottom lash line from inner to outer corner with your everyday eyeliner. Using the attached smudger, lightly blend inside to out to soften the edge of the liner. 3. Apply mascara to your eyelashes creating a dramatic length. 4. Using a brown shadow or pencil, define your brows with the closest color of your natural eyebrows to create a dramatic look. 5. Finally, use any red color lipstick to complement your “Cat woman” look. 6. For the full “Cat woman” look, wear a leather top, leather pants, and shiny leather boots with heels! 1. Wear a long-sleeve leotard and put your hair in a bright, glittery scrunchie! Numerous sites are selling recreations of team USA's sparkly leotards for a reduced price. However, you can spend less money by just buying a plain red or blue leotard, buying glue-on jewels, and creating your own shiny look! 2. Another great outfit is from the "Fierce five" medal ceremony. For this costume, wear black athletic pants, a gray zip-up jacket, and athletic shoes. To complete the look, hold a bouquet of flowers, wear a gold medal, and carry an American Flag!